Dame Helen Mirren has won best actress at the Royal Television Society Awards for her role in ITV1's Prime Suspect. But the final run of the crime drama lost out to Channel 4's Low Winter Sun in the best drama serial category. Michael Sheen, who co-starred with Dame Helen in the Oscar-winning The Queen, was voted best actor for BBC Four's Kenneth Williams: Fantabulosa! ITV's Coronation Street won best soap, beating rivals Emmerdale and The Bill. BBC's EastEnders was not nominated. Opening the awards, host Mark Austin made light of recent problems with TV phone in competitions by joking: "There are 28 awards tonight, it's not too late to vote - premium lines are open. We have decided the winners, obviously, but we're desperately in need of the dosh." Best actor Michael Sheen - Kenneth Williams: Fantabulosa! Best entertainment How Do You Solve A Problem Like Maria? Drama serial winner Low Winter Sun told the story of a Scottish detective, played by Mark Strong, who murders a colleague he suspects of killing his girlfriend. Despite not having a nominee for drama serial the BBC had a good evening, winning 18 of the 28 awards at London's Grosvenor House Hotel, with ITV taking home four. 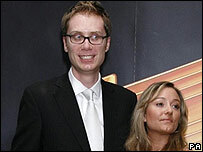 Extras star Stephen Merchant won best comedy performance, beating comedienne Catherine Tate, while best comedy went to The Royle Family: The Queen of Sheba. Merchant poked fun at the award itself, saying it was like "something you get for winning at judo in the community centre". Sound of Music talent show How do you Solve a Problem Like Maria?, which launched singer Connie Fisher to fame, took the award for best entertainment. The popular series Planet Earth: From Pole to Pole was chosen in the best science and history category. Meanwhile, actor Sacha Dhawan won the on-screen breakthrough award for his role in Channel 4's Bradford Riots, beating comedian Russell Brand and Joseph Mawle, from BBC Two's Soundproof. Newsround won best children's programme for The Wrong Trainers, part of a campaign to highlight child poverty.